This week, we’ve released an exciting upgrade that we wanted to share! As more customers are now creating dozens or even hundreds of documents, we’ve received requests to improve document organization in Lucidchart. With this in mind, we’ve rolled out an entirely new document management system. If you’ve logged in recently, you may have already noticed that there are three new panes to the Documents page. The left-hand pane displays the folder structure and trash. 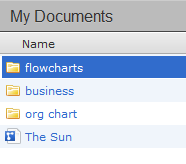 All documents which were ‘tagged’ in the old document system can now be found in folders of the same name. The middle pane shows documents and sub-folders of the selected folder. Files and folders can be seamlessly dragged between the left and middle panes for quick sorting. Also, simply double-click a document or folder in the middle pane to open it. The right-hand pane displays a preview window and buttons to open, delete, and convert a document to a template. Templates can be used to make new documents or be converted back into documents. Right-clicking a file or folder also opens a quick menu to delete or rename it. 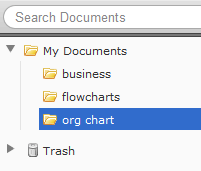 We sincerely hope you enjoy the all-new documents folder organization. Stay tuned as we’ll soon be releasing additional improvements for group management and folder sharing. As always, we look forward to hearing from you if you have any questions, feature suggestions or feedback. Thanks again for using Lucidchart and happy diagramming!